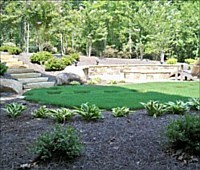 Maintaining the beauty of your lawn, can be a tiresome, time consuming matter. 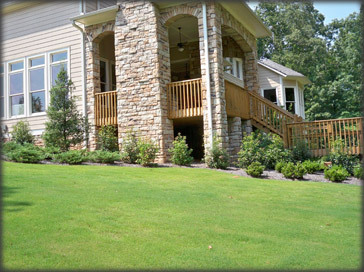 With our lawn maintenance program we can make sure that you have the time to enjoy your outdoor living area. Turf and sodding can be done by homeowners, but it can be very time-consuming and demanding. This is why Four Seasons Landscape Management offers lawn installation and maintenance services, including turf and sodding, for both residential and commercial properties, no matter how small or large they are. Bermuda - This type of turf is ideal for lawns that are exposed to full sun. This requires minimal maintenance because it is highly resistant to disease and the growth of weeds. Zoysia - This variety can grow in most types of soil. It can survive even with minimal water intake. It grows into a thick, dense, and cushion-like grass lawn. Centipede - If your lawn has sandy or clay-like soil, centipede grass is your best option. It can thrive even in shaded areas of a landscape, as long as it has access to enough water. Fescue - For lawns or landscapes that are more shaded than exposed to the sun's heat, you need to choose cool season grass types. 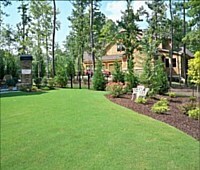 Fescue is a cool season turf that can withstand the climate of Georgia. Improving a lawn or landscape involves covering any exposed soil with grass. This way, it enhances the overall look, while providing a good method for preventing soil erosion. Although you could seed the bare soil, you may have to wait a long time for it to grow. This is the reason why we highly recommend sodding of your lawn. It instantly provides you with a grass-covered lawn with utmost coverage. When you hire us for this task, we start by carefully assessing the area for sodding. First, we measure it and taking certain slopes and hills into consideration. The soil should be loosened and cleared of any debris, like rocks. It is then flattened to make it firmer and to check if there are any low spots or holes that need filling. After the soil is leveled, it is watered to create a moist base for the sod. When the soil is moist enough, the sod is installed as close to each other as possible. They are then watered to help start the growth process, through which the roots of the sod would start growing into the actual soil. When it comes to turf and sodding installation and maintenance, you can definitely rely on Four Seasons Landscape Management. All you have to do is give us a call, and we'll take care of your lawn.